He’s had a near-death experience! We all have. It’s called ‘living’…. Terry Pratchett’s Hogfather was a Cannonball Read book exchange gift to me from Malin. On my wish list, I had indicated that I hadn’t read anything by Pratchett, and Hogfather is a delightful introduction to his world, aka Discworld. It’s a twisted and sometimes demented place, which means it’s quite a lot like the world we inhabit, except for the magic, gnomes, talking animals, etc. The action here is set on Hogswatchnight, which is like Christmas Eve. Hogfather (Santa) has gone AWOL and Death picks up the reins for him (literally) in order to make sure that the children get their gifts. But what has happened to the old guy? And how did Death get involved? Death’s granddaughter Susan, a no-nonsense governess who knows her way around a poker and isn’t afraid to use it against bogeymen or monsters, has to unravel the mystery before the universe gets thrown completely off balance. The novel opens with the introduction of Mr. Teatime, a member of the Guild of Assassins whose particular psychopathy has put him on the fringes of that organization but has made him the go-to assassin for a shadowy group known as the Auditors. Teatime has a job to do which requires a special skill set coupled with ruthlessness. The reader doesn’t know exactly what the job is, but Teatime surrounds himself with a group of professional thieves and lockpickers, and he does not hesitate to rid himself of those who prove useless. Meanwhile, at Unseen University, whose professors are wizards, preparations are underway for the Hogswatchnight feast when a series of unexpected visitors begin to arrive, much to everyone’s puzzlement and consternation. Governess Susan, expecting a usual, “human” sort of night with her young charges finds instead a raven and the mouse of death in her room. They inform her that her grandfather, Death, is dressed up as Hogfather and acting his part. With his sidekick Albert the gnome dressed as an elf, Death has taken to visiting the local mall to let children sit on his lap to tell him what gifts they want, and he and Albert are riding rooftop to rooftop behind a sleigh of hogs delivering justice in the form of appropriate gifts. Needless to say, chaos ensues. Susan pays a visit to the university to see if she can figure out what is going on and then sets out to find the real Hogfather and ultimately face off against Teatime. Hogfather is an extremely funny read that also deals cleverly with some rather deep issues. At heart it is a book about belief and fantasy, and about what makes us human. I honestly could see this being a useful book to use in a religion or philosophy class, or an anthropology course. As Pratchett tells us through Death, “It is the things you believe which make you human. Good things and bad things, it’s all the same.” That’s something to think about. Share the post "Where the falling angel meets the rising ape"
I need to read more Pratchett. My first book of his came from the CBR exchange too. I shamefully have not read it yet. Must rectify this soon! Oh, I’m so glad you liked it! 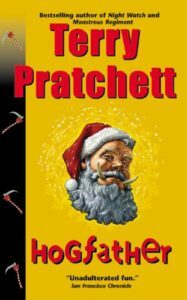 Hogfather is from a point in the series when Pratchett is in full control of his sprawling world-building, characters and sharp wit. Some of the earlier books are more rough around the edges. If you liked this, you’re likely to like the rest of the Discworld books too and Good Omens. Because of Gaiman’s influence, it’s a different thing, but there are similarities. I have a few friends who really don’t like Pratchett’ style of writing. I think he’s amazing and am so sad he died (and that Alzheimer’s made him lose his cognitive faculties before he did). Such an angry, passionate man on so many issues. Enjoy getting to know his work. I most likely will read more. I loved his style and humor and was pleasantly surprised by the profundity of his message. Very cool stuff. I think I’ll reserve Pratchett for those times when I’m in need of a break from the “serious and important” stuff that lacks humor. If you get into Discworld, remember that it is a universe, not a serial of stories in chronological order. There are lots of nice suggested reading guides, that group the books in somewhat sequential order by sub-thread or main characters (ie, the wizzards, tiffany aching, the death series where Hogfather fits in, the City Watch, etc).